32% of donors in Africa prefer to give cash which is the highest of any region. Charitable organizations in Africa have limited access to traditional online fundraising technology, however, as the sector evolves over the next decade, much of that cash giving will likely transition to online and mobile giving. 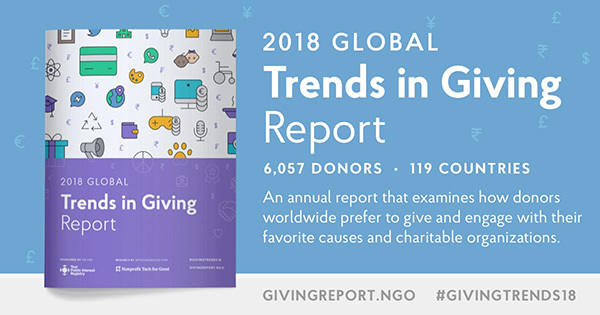 6,057 donors completed the 2018 Global Trends in Giving Survey and based on their responses, the donor community worldwide is made up of primarily women (65%) who have a liberal ideology (53%), characterize themselves as religious (72%), and give between ($101-$1,000 USD) annually (43%). These donors are most likely to support the causes of children and youth (15%), health and wellness (11%), and animals and wildlife (11%). 54% of donors worldwide prefer to give online with a credit or debit card and 9% through PayPal. Donors are much less likely to give through mobile apps/wallets (4%) and through text message (1%). Increased access to online and mobile giving technology in Africa, Asia, and South America will likely grow these numbers significantly in coming years. 29% of donors worldwide say that social media is the tool that most inspires them to give, however, email is a close second at 27%. In third place is an organization’s website at 18%. Together, digital communications inspire 74% of donors to give. Organizations must invest in technology to stay relevant. Of those donors inspired by social media, 56% say that Facebook inspires them the most. 20% say Instagram, and 13% say Twitter. 18% of donors worldwide have donated to a charitable organization directly through Facebook. Of those, 88% say they are likely to give again through Facebook. Of all social media worldwide, Facebook dominates and its new fundraising tools will likely transform global giving. Traditional TV and radio only inspire 9% of donors to give, but that number could increase if internet-based TV and radios apps, such as Netflix and Pandora, tailored their programming and advertising services to cater to organizations. Smart-home voice assistants, such as the Amazon Echo and Google Home, could also provide new ways of giving. Messaging apps have very little impact on donors. Only 1% of donors worldwide say that they are inspired to give by messaging apps. Of those, 59% named WhatsApp as the most inspirational. 30% said Facebook Messenger and 5% said Snapchat. If Facebook extended their fundraising tools to WhatsApp (owned by Facebook) and Facebook Messenger, messaging apps would likely become much more powerful in their ability to raise money for charitable organizations. Only 14% of donors worldwide gave on #GivingTuesday 2017 – 40% did not. A whopping 46% of donors worldwide have never heard of #GivingTuesday. Launched in 2012, #GivingTuesday has tremendous opportunity to grow into a global day of giving that could raise hundreds of millions of dollars for organizations. Crowdfunding campaigns that benefit individuals are growing in popularity worldwide. 41% of donors to charitable organizations also donate to online crowdfunding campaigns that benefit individuals. Worrisome to some organizations, but not surprising, 16% of these donors say that they give less money to organizations due to their crowdfunding. 33% of donors worldwide give tribute gifts and the top three occasions are memorials (43%), birthdays (25%), and religious holidays (10%). That said, very few organizations actively promote tribute giving and doing so would likely a result a steady revenue stream. Baby Boomers are most likely to give tribute gifts at 41%. 31% of Gen Xers give tribute gifts as do 26% of Millennials. Generational differences are lessening due to technological advances. Millennials, Gen Xers, and Baby Boomers all prefer to give online and digital communications significantly influence their giving. Baby Boomers are the generation most likely to give as a result of direct mail/post (18%), but overall, all generations are becoming more homogeneous and tech-based in their giving habits. Religious donors are more likely to give to charitable organizations that provide basic needs and support the causes of children and youth, health and wellness, and hunger and homelessness. Non-religious donors are more likely to give to the causes of animals and wildlife, human and civil rights, and international development and relief. Older and mid-size major donors are the most likely to be religious while younger micro and small donors are the most likely to be non-religious. Donors of all sizes prefer to give online, however, micro-donors are the most likely to give cash while major donors are the most likely to give through direct mail/post. That said, no matter how they give, the vast majority of donors (69%) prefer to be thanked for their donations via email. Donors are very involved with their favorite causes and charitable organizations offline. 67% volunteer locally, 9% volunteer internationally, and 56% attend fundraising events. Individuals that give money are also willing to give their time. Donors are also highly engaged in civic life. 91% vote regularly, 72% sign online petitions, and 27% attend marches and protests. 31% of donors worldwide give to organizations outside of their country of residence. Online giving technology – combined with access to a 24/7 global news cycle and more affordable international travel – has led to an increase in donors with an empathic worldview. Privacy rights are a growing concern for donors. 80% do not want organizations to share their contact information with other organizations and 92% want organizations to make a concerted effort to protect their contact and financial information from data breaches. In Africa, newly launched crowdfunding services that enable individuals to create online fundraising campaigns to raise money for personal expenses, such as medical bills and education costs, are pioneering online giving. As a result, at 50% African donors have the highest rate of donating to personal crowdfunding campaigns in the world. Asian donors are primarily driven by digital communications. 51% prefer to give online and 41% are enrolled in a monthly giving program. Email (29%), social media (26%), and an organization’s website (21%) inspire the most giving. Rapid advancement in technology across the Asian continent over the last decade has laid a foundation for the Asian donor community to emerge as a tremendous force for good worldwide. Tied with European donors, at 44% Asian donors are also most likely to give to organizations located outside of their country of residence. At 12%, Asian donors also have a high rate of volunteering internationally compared to the global average of 9%. Only 1% of donors in Australia & Oceania gave on #GivingTuesday 2017, the lowest of any region. They also are the least likely to give through Facebook (7%). With more awareness, both #GivingTuesday and Facebook Fundraising Tools could provide significant new funding for charitable organizations in Australia & Oceania. 19) At 75%, donors in Australia & Oceania attend fundraising events more than any other region, and at 21%, they are also the most likely to create peer-to-peer fundraising campaigns to benefit organizations. It’s also worth noting that, at 60%, donors in Australia & Oceania are most likely to be small donors. At 39%, Europe has more Gen X donors than any other region. 61% are female and 47% are non-religious. Also, tied with donors in Australia & Oceania, European donors are the most likely to give to international development and relief (12%). Finally, European donors are unique in that they give more to human and civil rights (9%) than other any region. 21) Tied with donors in South America, European donors are the most likely to give through bank/wire transfer at 20%. 52% are enrolled in a monthly giving program, the highest of any region. Finally, at 16%, European donors are the most likely to volunteer internationally. 60% of donors in North America prefer to give online with a credit or debit card, the highest of any region. Only 6% prefer to give cash, the lowest of any region. 22% gave on #GivingTuesday 2017 and 28% have donated through Facebook – the highest rates worldwide and likely due to the fact that #GivingTuesday originated in North America and Facebook Fundraising Tools were first launched in the United States. North American donors are also the most likely to be inspired to give by email (31%) and consequently, the most likely to trust websites and email addresses that come from a .org domain extension (73%). North America also has the highest rate of Baby Boomer donors (41%) and donors who have charitable giving in their last will and testament (20%). Donors in South America are the least likely to have heard of #GivingTuesday (75%) and only 6% have created a peer-to-peer fundraising campaign. With more awareness, both #GivingTuesday and peer-to-peer fundraising technology could provide significant new funding for charitable organizations in South America. Donors in South America are unique from other regions in that they are more likely to be inspired to give by Instagram (30%), give the most to support the cause of animals and wildlife (17%), and characterize themselves as religious (78%).